DARK or LIGHT. World Rock Progressive. Ambient. 2010. TO THE LIGHT. 2009. Recovery. World music, ambient, rock, progressive. SIGHT FROM RUSSIA. Recovery. World, pop, industrial, progressive. RECOVERY. Music cures. Russian modern symphonic music. ENJOY MY GOD. Recovery. World, pop, ethno, meditative. 10 REVELATIONS. Recovery. World christian, russian rap, art. IRISHA (Moscow). Pop, soul, ballade, funk, classic. 2008. NASTASYA (Moscow). Pop, soul, ballade, R&B, funk, hip-hop. 2009. ROVING THOUGHTS. Meditative, Chill, Psycho. Live Show of Askura – “NIGHTMARE”. Moscow. Stadium “Olympic”. Video. ATTRACTION 80s – the Gold Selection. USSR. Alexander Shkuratov. The book of poems “Insight”. Askura World. Russia. – Where we Go? Our General Riches – Perception and Understanding of all Cultures of Nations of the World on our Planet. The Mankind suffers from never-ending wars and human victims. People dream about Peace and Prosperity. They dream about Love and about Trust each other. But as we see that everything in our world goes tragically contrary. – WHERE WE GO? Music Producer and the Author of the Script – Askura Alexander Shkuratov. Video mix: Archandr and Askura Alexander Shkuratov. The Set Designer: Archandr Artstudio. Askura Music – the best way to follow your favorite music and download it. Your music, videos, and more. FREE Download your music quickly: The easiest way to get your MP3 onto your PC. You can put it on your iPod or any other MP3 players, play it on your computer, or burn it to a CD as many times as you want. Free song pre-listening: Askura Music lets you listen to more than 30 seconds songs. Discover your new favorite album: reviews and recommendations on the store. Now the music that moves you can go anywhere. Each composition of the album “Enjoy my God” is weaved from elements of world ethnos that gives to compositions unique and rare sounding. It also is the main source of inspiration for the author of the project as different world ethnos, cultures, religions and languages beautifully are in harmony among themselves, supplementing, and enriching each other in uniform musical space of each creation. All music, lyrics, arrangements & sound by Askura Alexander Shkuratov. Exclusive stuff from Askura Alexander Shkuratov. Our World interesting and beautiful because He is Great and Diverse. The set of cultures, nationalities, ethnoses, and religions make the World polyphonic and attractive. Many artists use in the creativity various colour of national cultures. Example for this purpose is Alexander Shkuratov’s “Askura World” project. 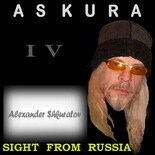 Fourth album Askura – “Sight from Russia”. It is logic continuation of first three albums of project “Askura World”: “From Nowhere”, “Enjoy my God”,”10 Revelations”. During an epoch of rapid development of industrialization more and more the Mankind aspires to sources of culture, to sources of the Internal Maintenance. Alexander Shkuratov is a unique Author and Producer who is capable to connect different World Cultures in united musical space. This space it is Music. SHE draws to herself beautiful melodies, harmony and feelings. If in Alexander Shkuratov’s one compositions can harmoniously to be combined shades and originality of world cultures then the Mankind is capable to live in the Consent and Peace.It is impossible to put a priority to one culture, thus neglecting other culture. Ours the common riches it’s recognition and understanding of all cultural property of our Planet. The Music weaved from flowers of our World, it also is Alexander Shkuratov’s Music. Like each other, listen to Beautiful Music, and Feel the World in all His Divine variety. It is Alexander Shkuratov’s Sight at the World.